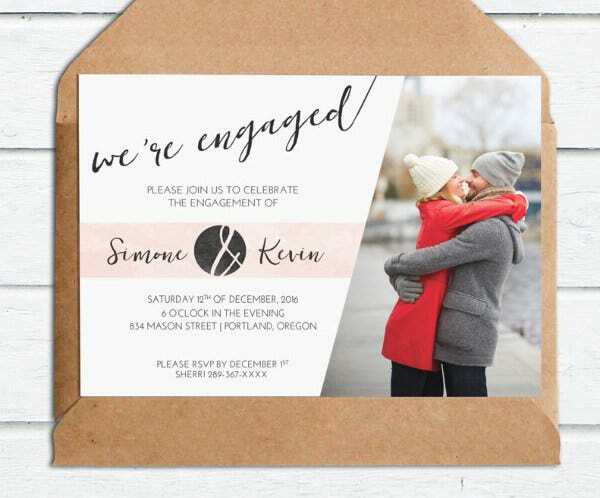 On the search for engagement invitation templates? Thank your lucky stars. 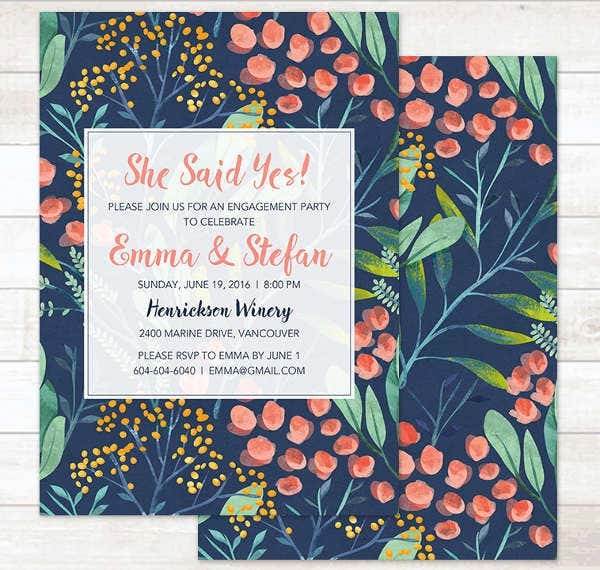 An engagement party is a magical and special day for the couple as they officially announce and celebrate with their friends and family their decision to finally tie the knot. 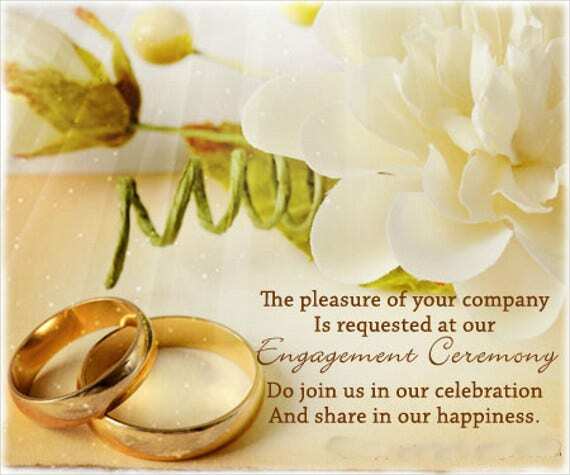 It is a celebration of love, friendship, and gratitude for the love and happiness that the couple feels. 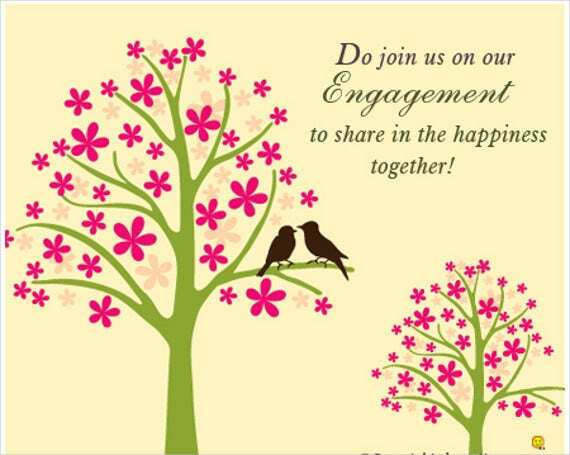 In light of all this, engagement preparations can be overwhelming and stressful for the couple. 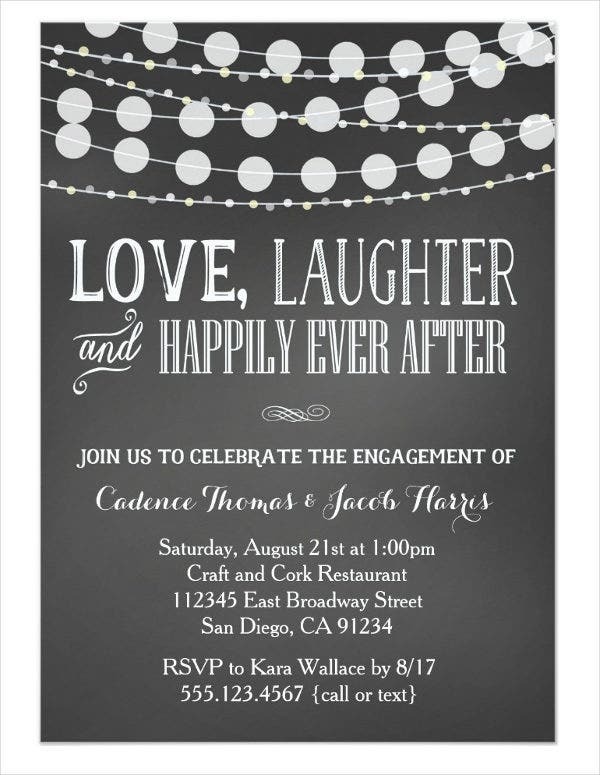 And most of the time, engagement invitations are not given much attention. 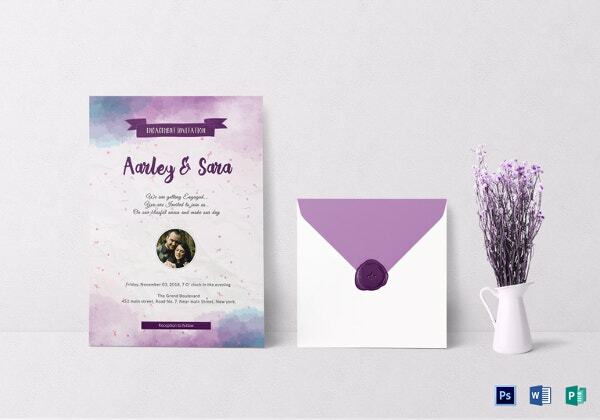 To help you choose and create engagement invitations, you can simply browse through and download from our list of templates. The roots of European engagement practices are mostly founded and patterned after their Jewish law. According to their beliefs, marriage consists of two separate acts. 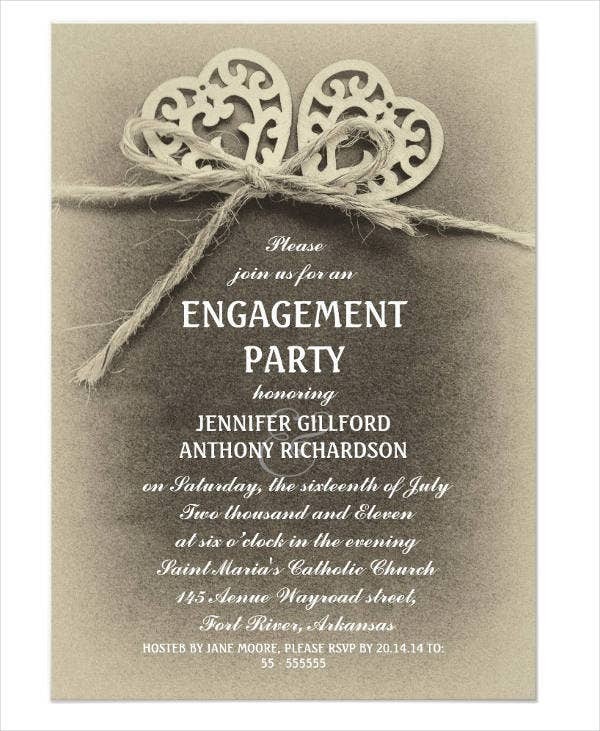 The first act is the sanctification process, which is more akin to the engagement party. The second act is the actual marriage ceremony. 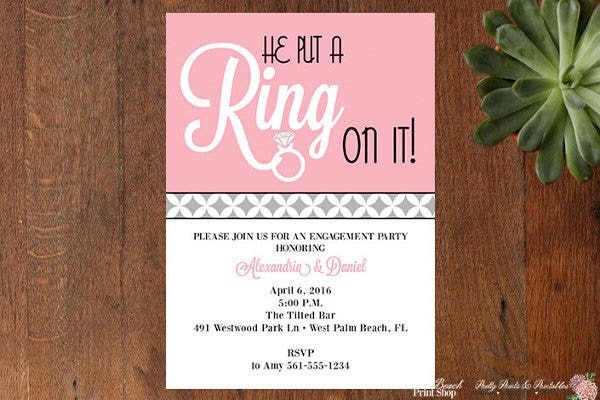 In ancient Greece, an engagement party is more of a commercial transaction rather than a sentimental and close family event. 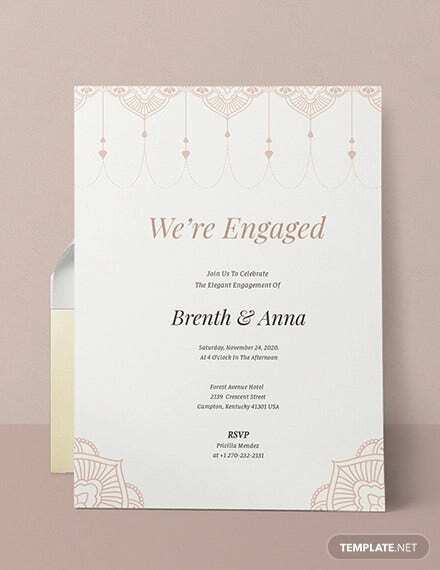 The party was characterized by an oral contract made between a man and a woman, but what was evident was that it was the father of the bride who made the agreement with the groom. The bride was not present in the said proceeding. On a different note, the Jewish engagement part was known as a vort. The celebration is characterized by the breaking of a glass or ceramic plates, which symbolizes the permanence and stability that a marriage conveys. 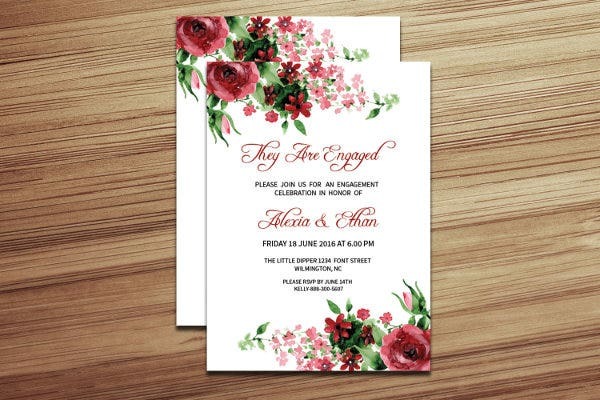 In Africa, the conduct of engagement parties is considered as the last remnant of their precolonial society—specifically, the Yoruba people and the their bride-price rites and Nguni people and their lobola practices. 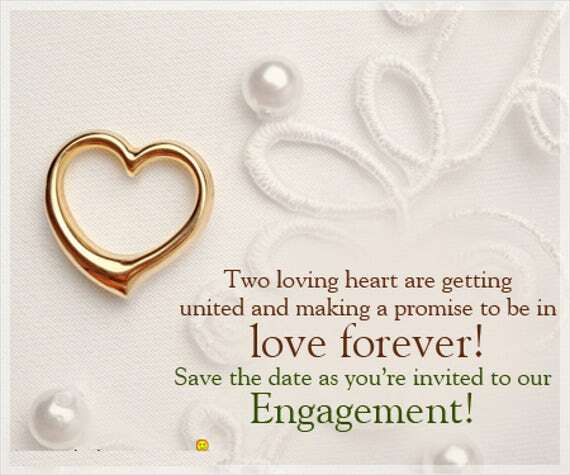 In terms of engagement rings, the customs and practices for the use of such also varies. The variation lies on the time, place, and culture. Traditionally and until now, an engagement ring is separate and distinct from a wedding ring. Such tradition originated from Judaism which was originally a golden nose ring given by Eliezer of Damascus to Rebecca around 1300 BCE. During the Roman empire, the Romans had the belief that the circle symbolized as a bond between two people who were to be married. It indeed signified eternal love. In other European cultures, an engagement ring is always worn either on the right middle finger or the left ring finger. The reason behind this was explained by ancient Egyptian physicians. According to them, it is because such position is conducive for the nerve which led directly to the heart. 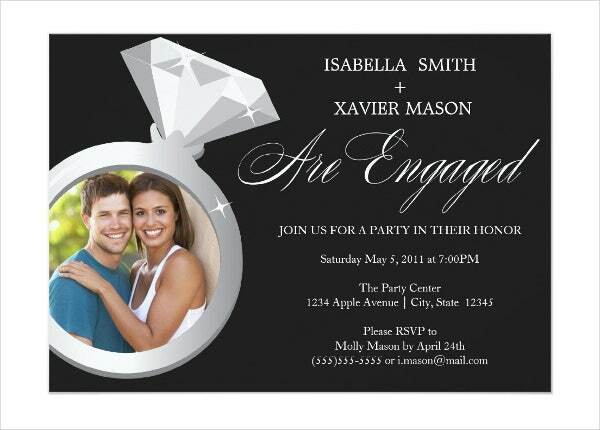 Moving forward to the modern times, the line between a private and public engagement party is getting thinner. 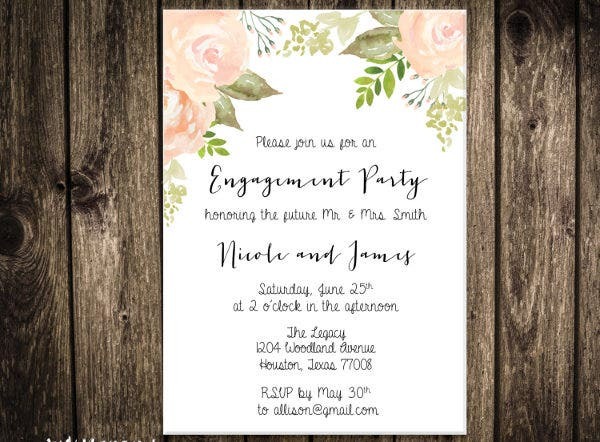 Because of the advent of social media caused by the advancements in technology, engagement parties are now publicized and available either online or offline. 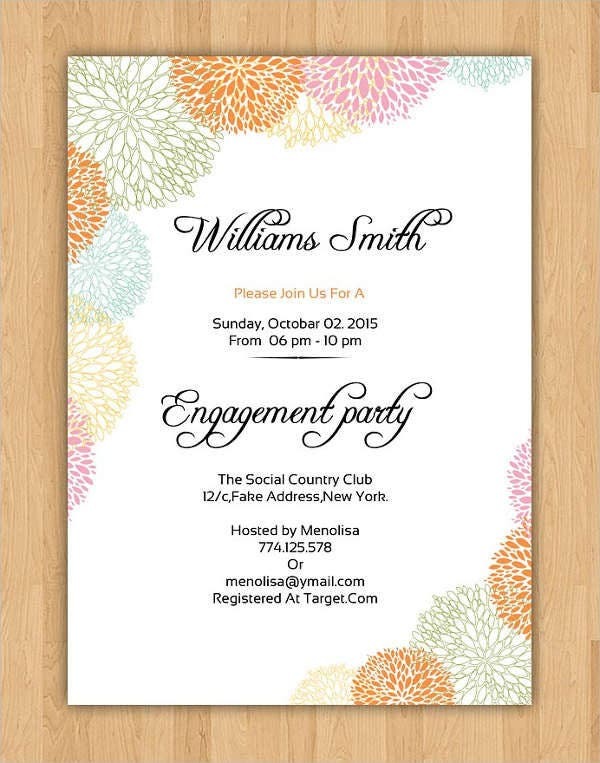 What remains clear is that engagement parties are not considered to be mandatory and compulsory. Couples are still given the option not to conduct them. 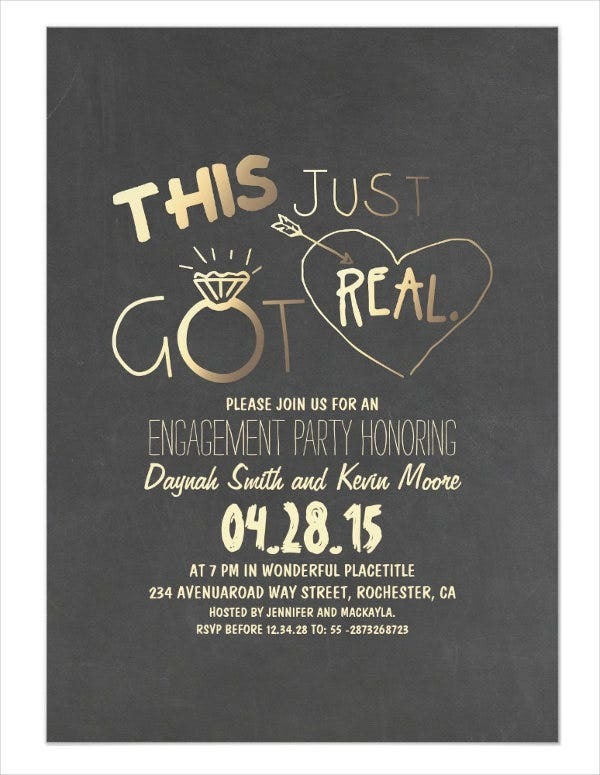 These are just some of the historical highlights of engagement ceremonies. 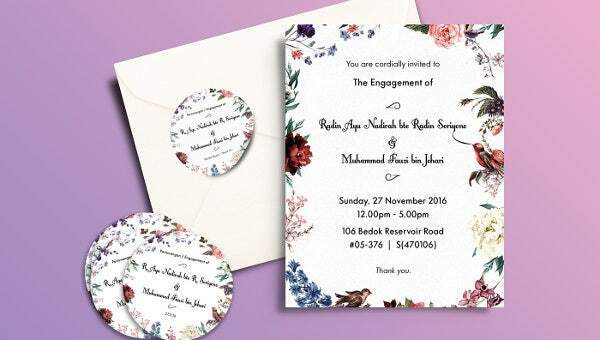 Nowadays, engagement parties are slowly shying away from religious practices and are more on parties and celebrations. It is often characterized speeches, songs, and adorable dances. 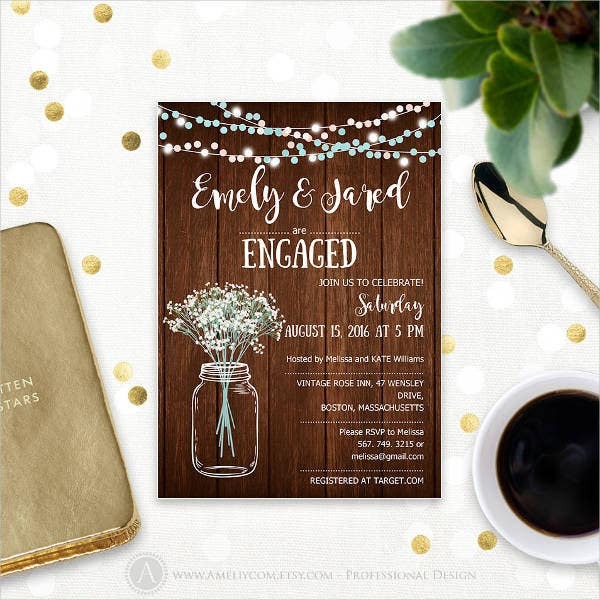 In addition to this are some simple and unique ways of celebrating such as engagement dinner celebrations. 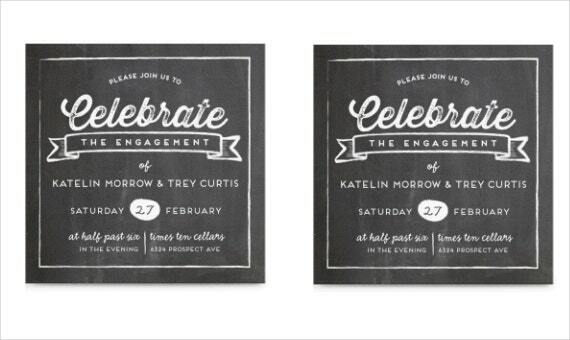 As we all know, engagement parties are just “pre-celebrations” before the couple’s big day. 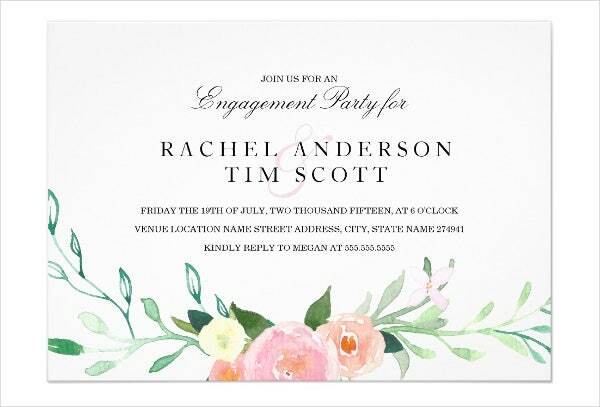 Engagement parties are not possible unless there are engagement invitations. 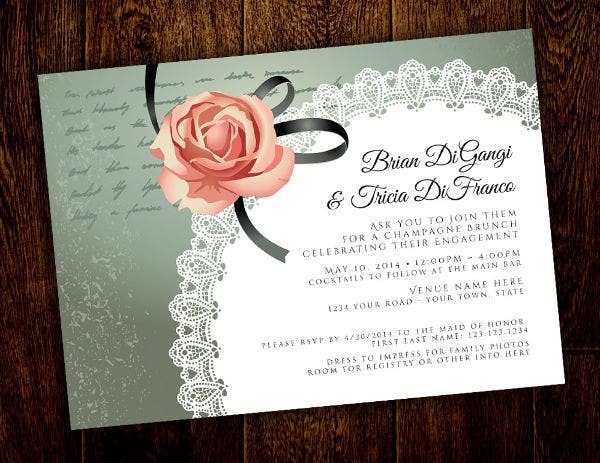 An invitation is defined as a written or verbal request inviting someone or a group of individuals to attend to specific undertaking or event. Name of the host. 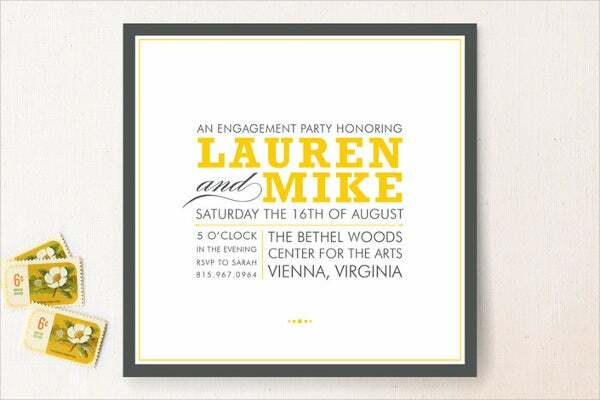 In here, you need to provide the name of the engaged couple. You are also given the freedom to apply creative writing in citing the host of the party. Event type. 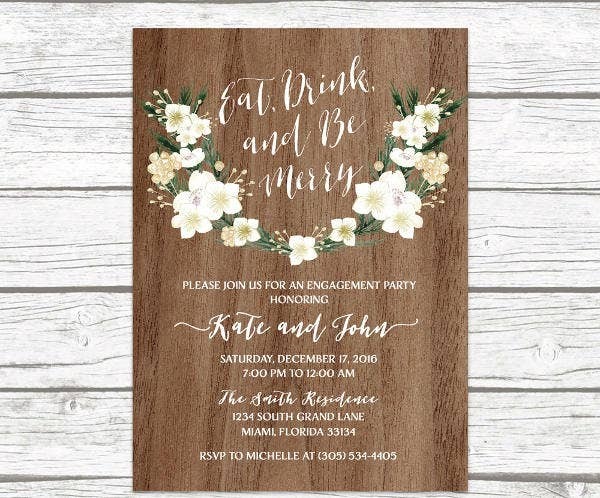 For engagement parties, you need to insert the nature of the party such as a dinner party or any theme and concept that the party organizers come up with. Date, time, and place. 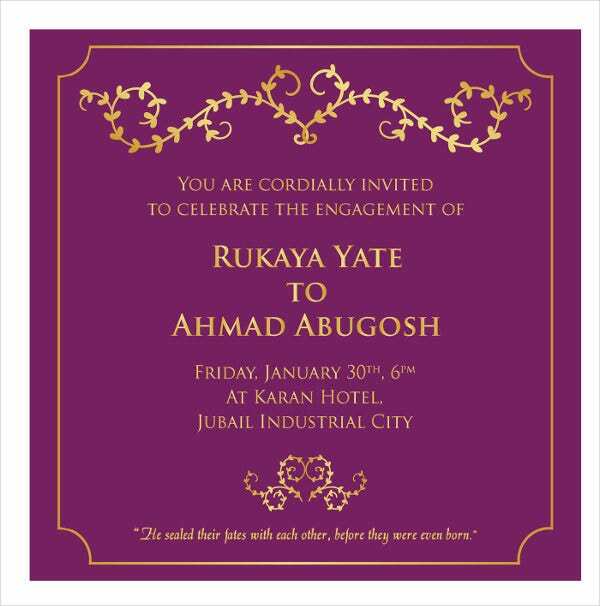 This is very a very important aspect of your invitation. You need to ensure that you add the correct venue for the party with the time and date. Other essential party details. Aside from them, you ca also add other important sections that you think are significant such as the requested attire for the said party. 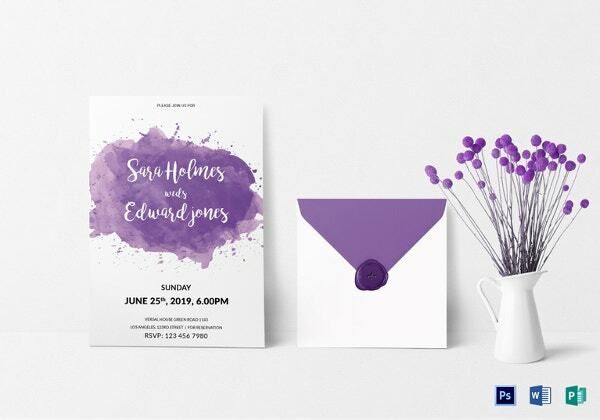 These are just some of the basic elements of an invitation. 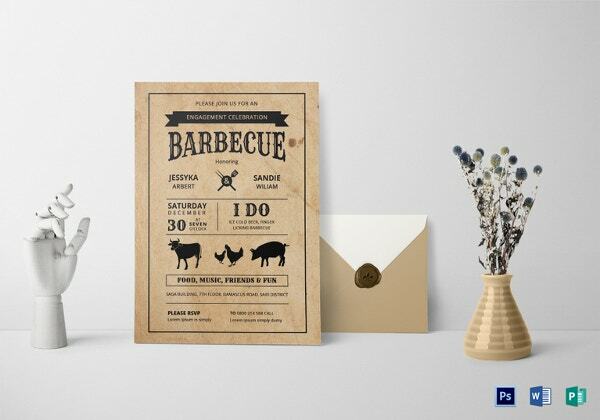 These elements are put together and arranged with respect to the couple’s chosen theme. 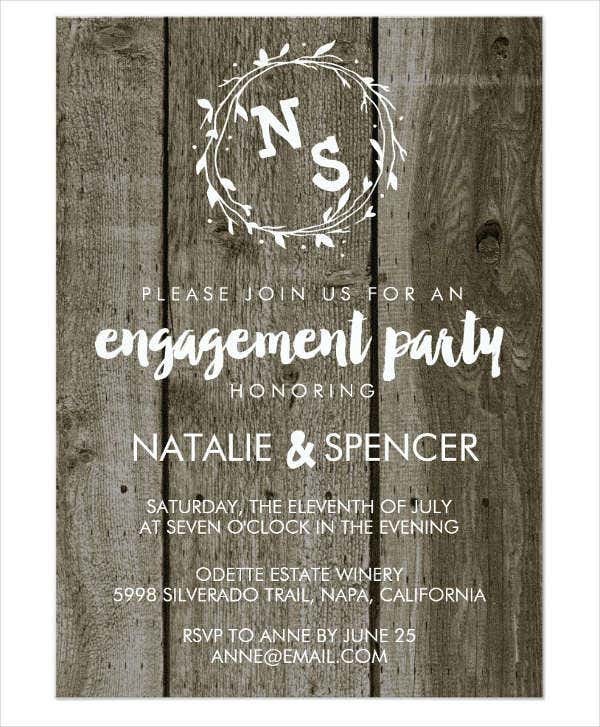 Vintage Engagement Invitations. This is a common theme adopted by most couples. The designs give an aura of nostalgia. 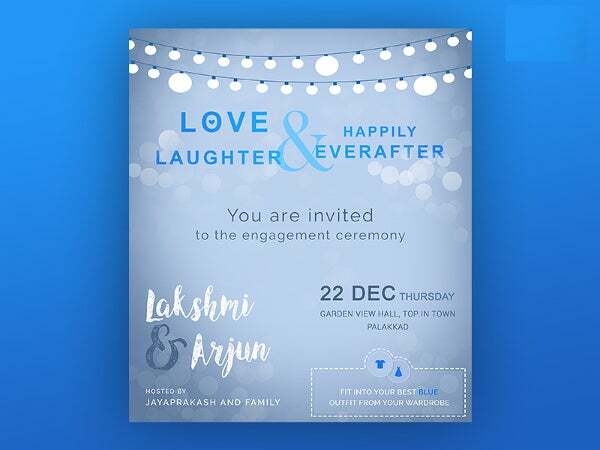 We all know that the engaged couple has very peculiar and unique journey to unfold to the guests. 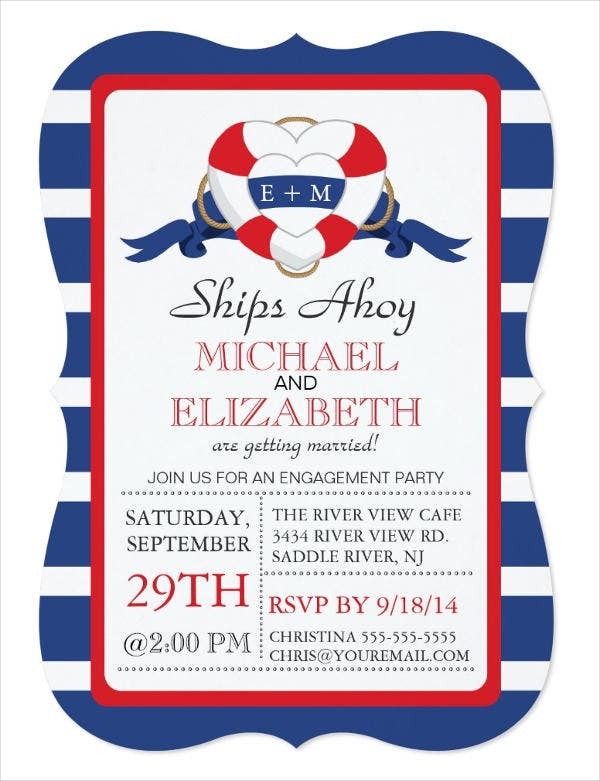 The designs will enable your guests to take a trip down memory lane. Glitz and glamour. It will showcase silver and glittery objects and designs. 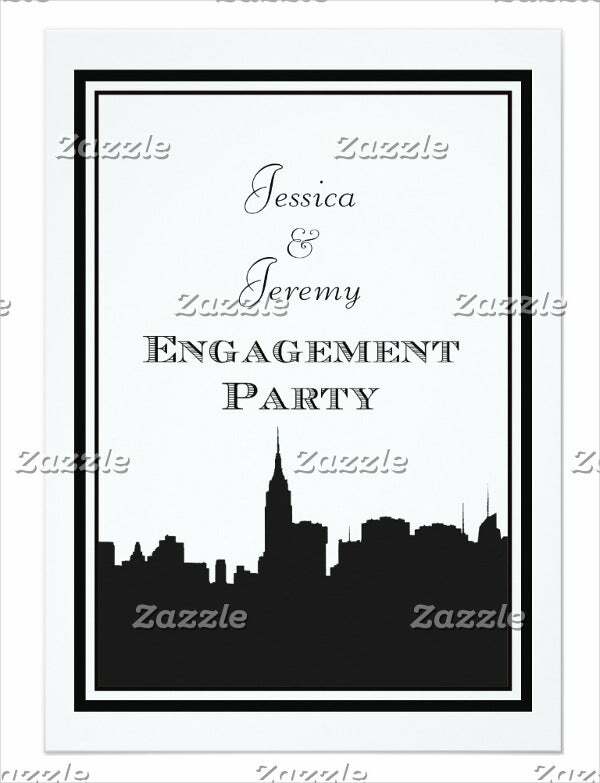 It is perfect for couples who wants to pull off a formal and classy engagement party. Festive theme. This theme is characterized by bright and vibrant colors. 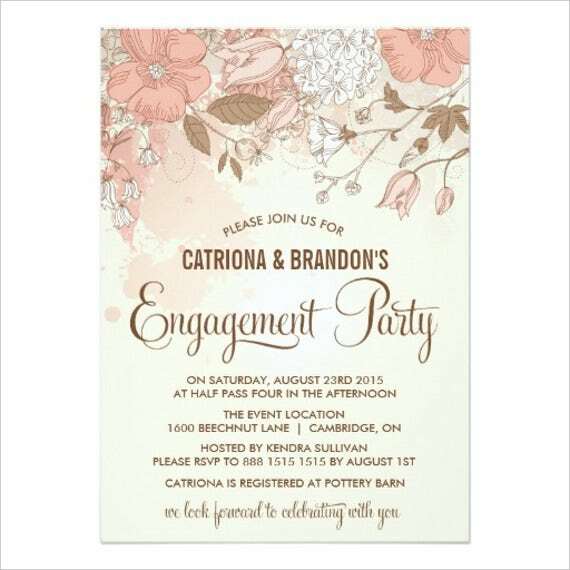 This can also refer to floral themes because of the color and warmth brought about by flowers. 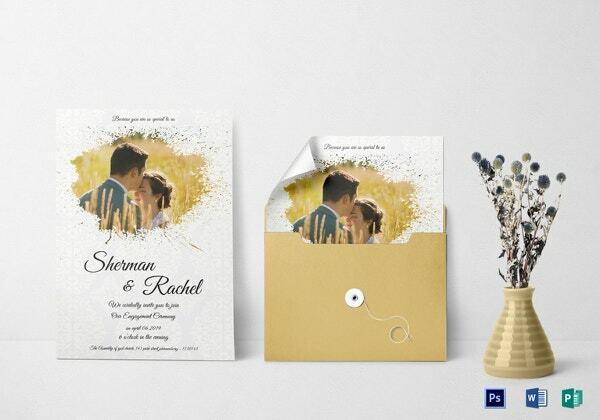 As you scroll through our templates, you can see that there are still a variety of interesting and exciting themes. 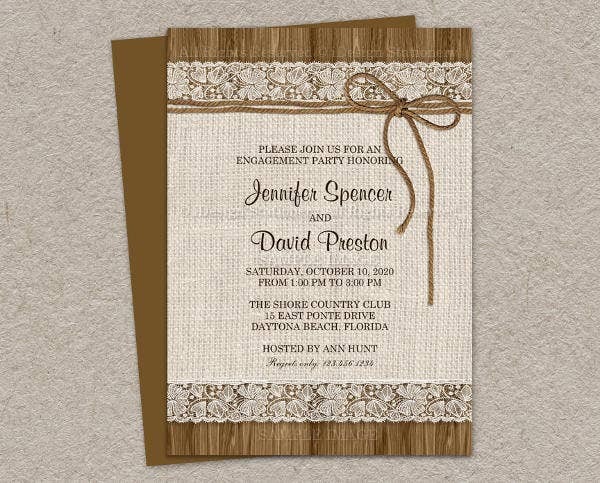 If you’re looking for Rustic Engagement Invitations, we also have some templates in store for you. Just click on the provided link to access them. Make the couple’s personality the foundation of the design. 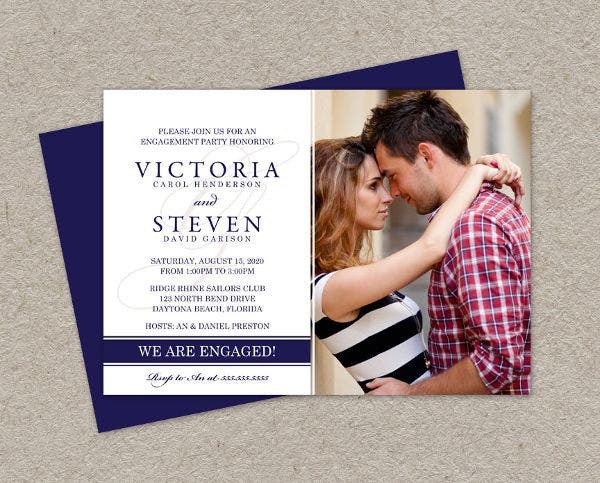 This means that the personality of the engaged couple must shine through the invitation card. In line with this. 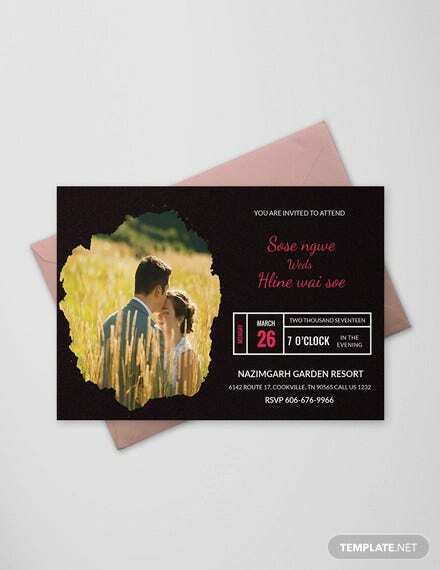 It is a good practice to add a photo or image of the couple in the course of designing the engagement invitation. After all, it is the couple’s magical day. Research is the key. Even in parties, a little bit of research is required. Research can help you brainstorm and come up with ideas. 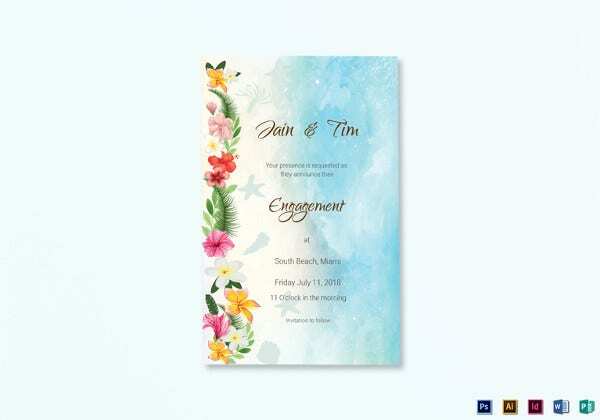 For instance, our templates here can help you boost up and gain inspiration in making your own masterpiece. Decide on a budget. 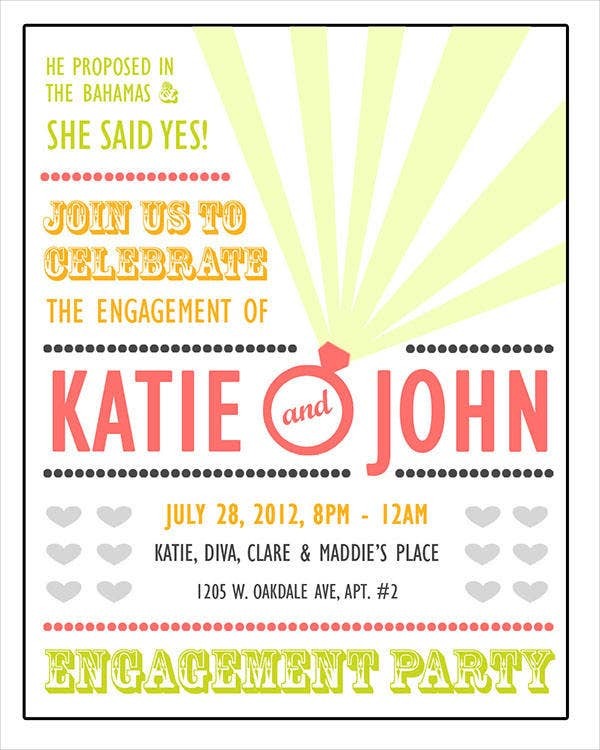 Practically, designing engagement parties would need a budget. You can find ways to maintain the balance of a great design minus the unnecessary expenses. Apply appropriate language and wording. 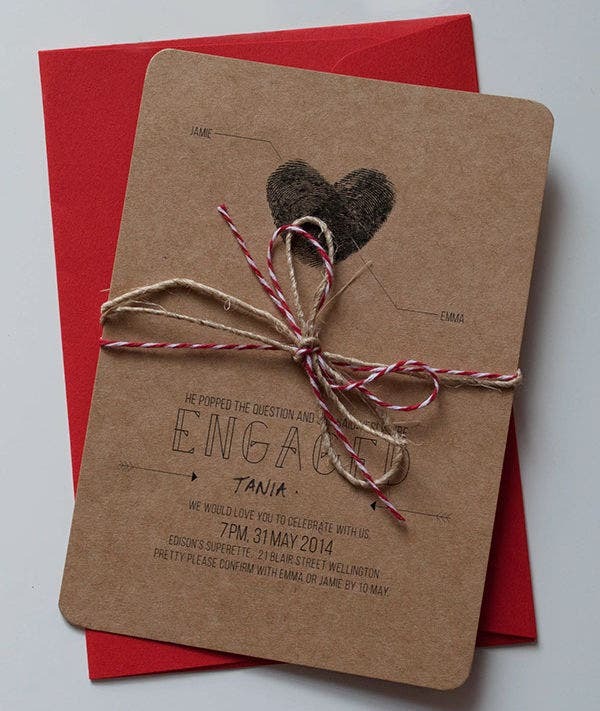 In the course of making the engagement invitation, ensure that you write the correct words and details. Use positive language. 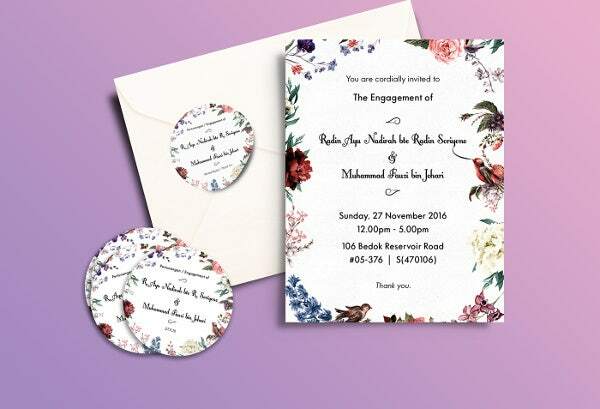 You can even be poetic because, after all, an engagement invitation provides a glimpse of the couple’s much-awaited wedding celebration. BUT avoid being too verbose. 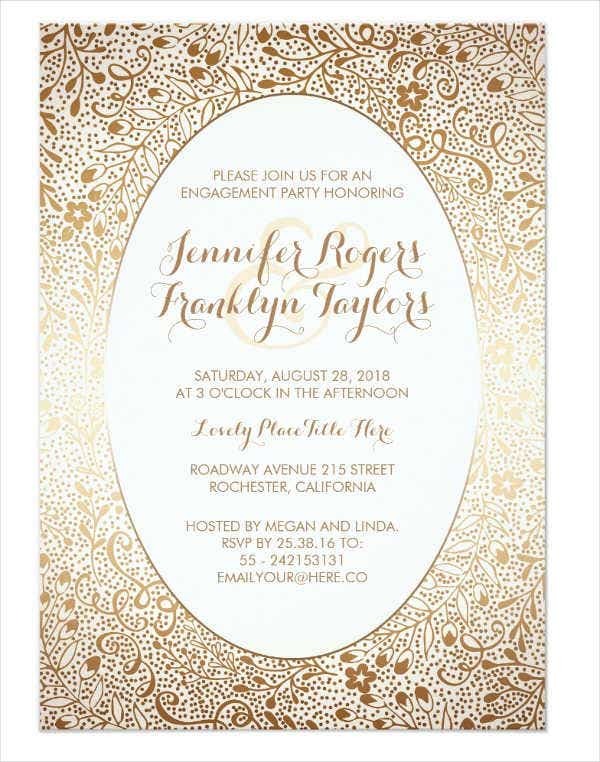 In addition to this, make it a habit to proofread your invitation cards. Prepare a guest list. This is also very significant. 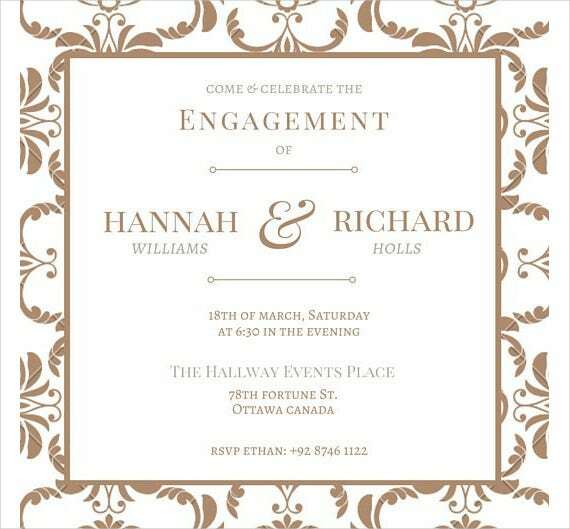 You should prepare the guest list beforehand in order to ensure that you’ve sent the enough invitation letters. By doing this, you can also avoid missing out some important people, especially amid an overwhelming preparation process. Sending thank-you cards. 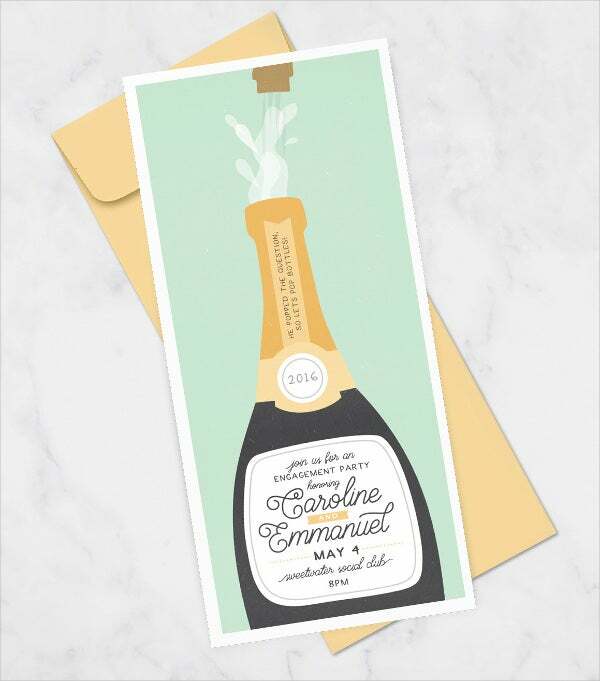 After the engagement party, it is advisable that you send out thank-you notes to those people who attended your precious celebration. 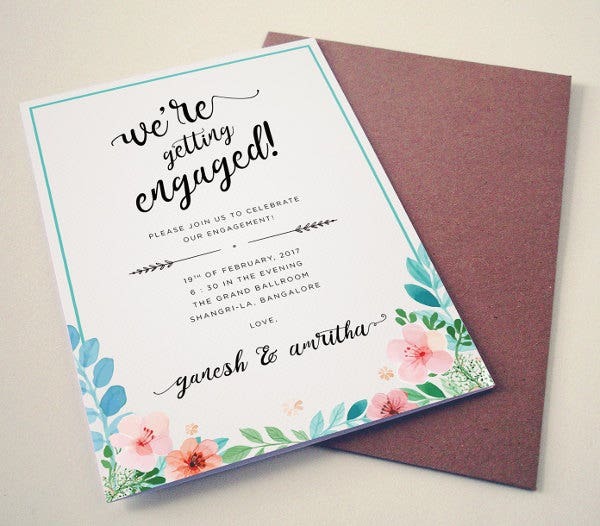 It is a way of showing your utmost gratitude and appreciation for those people who wholeheartedly spent time for your engagement party. 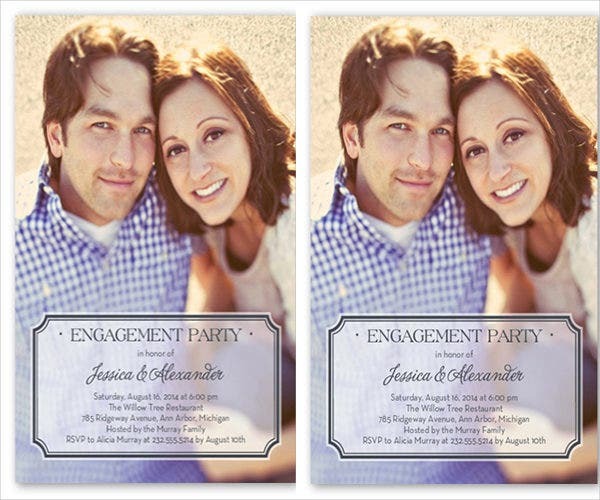 For your reference, you can also check out these engagement thank you card templates. The list is not exclusive. These are key points for your reference. 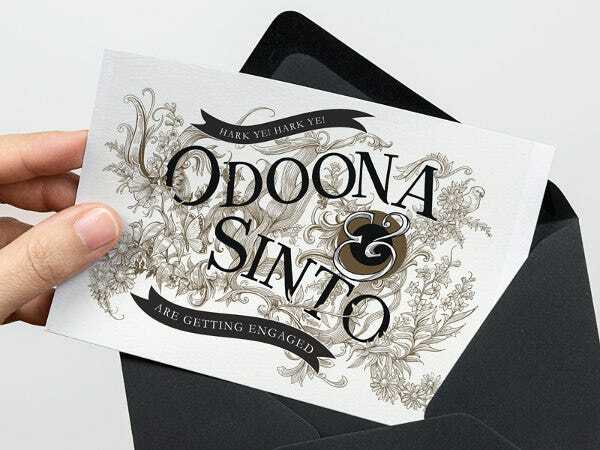 To give you the luxury of time to be more productive, you can just make use of our design templates, which are of high quality, original, printable, and easy to download. Discern and scroll through the page. Template.net offers a variety of templates for you. You can simply scroll down and check out the list of templates. 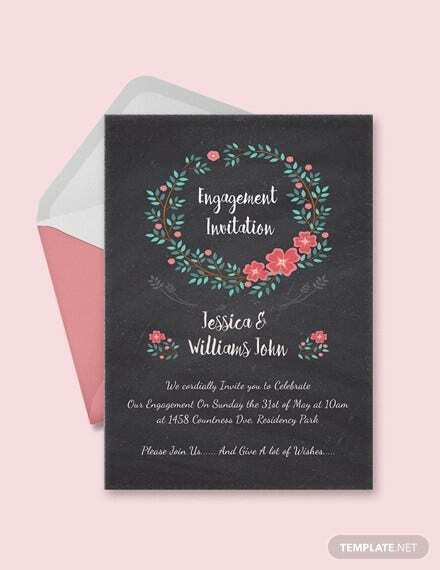 While scrolling down, there are also bits of relevant information and facts that are associated with engagement invitations that you can also use for reference purposes. Click on the green Download button below your chosen template in order to start downloading your chosen template. You can download as many templates as you want. 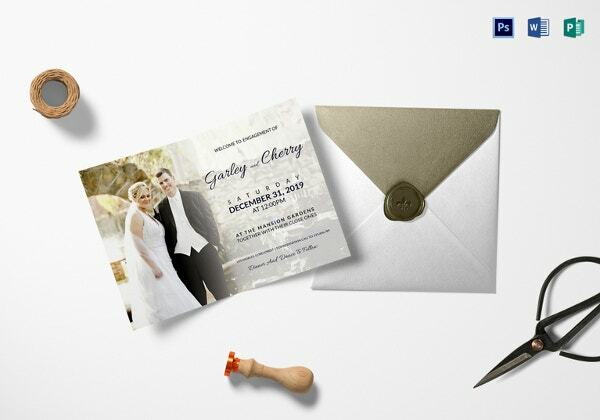 Take note that our templates are of high quality which means that you don’t need to worry about the technicalities. Print as many as you like. In addition to this, our templates are also printable. 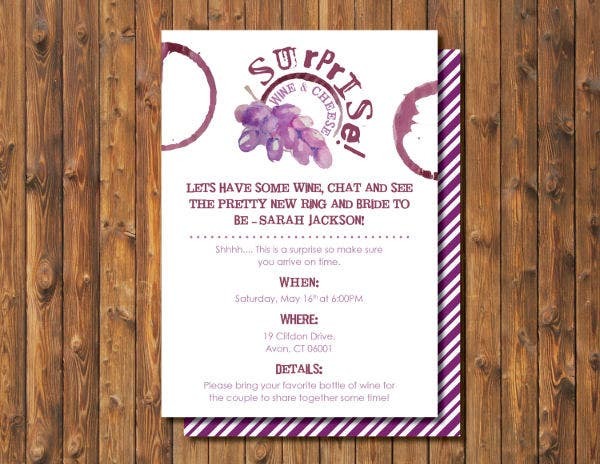 You can easily print them and customize them to satisfy your artistic inclinations. After that, you are now ready to edit your template of choice however you like. There you have it. 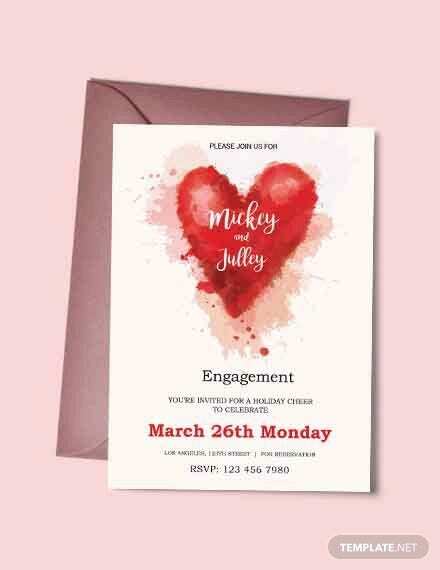 Indeed, our templates will make your life easier and more convenient. 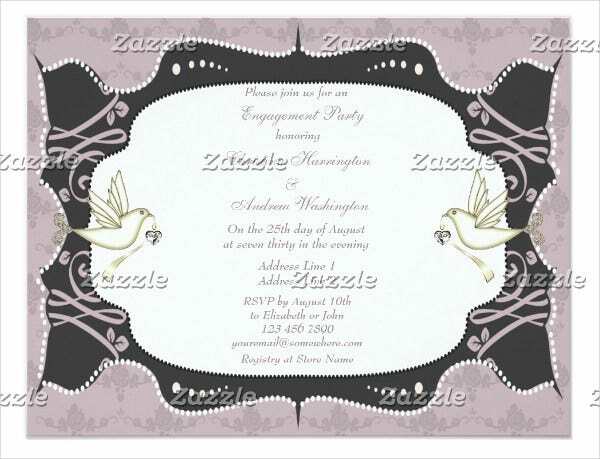 In addition to the said templates, we also offer other designs and templates. 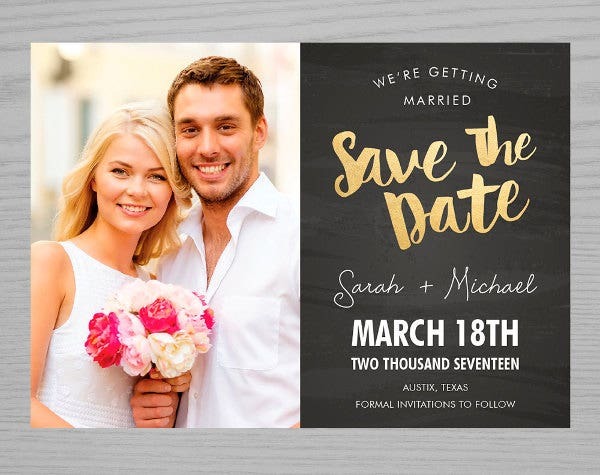 If you’re finding other ways to announce and show your upcoming engagement party, you can also check out these engagement banner design templates, which are also of great quality and design. Feel free and enjoy your stay at Template.net!